Ethical challenges confront each and every one of us in our daily lives. How honest should we be with our co-workers? To whom do we owe our greatest loyalty? How do we balance between our responsibility to family, community, profession, and self? …. Institutions deal with ethical challenges as well, and the way that they deal with them often defines the essence of the institution….Few institutions are affected as deeply by their handling of ethical challenges than schools, and few institutions have their very essence defined by the way they deal with ethical questions as schools. 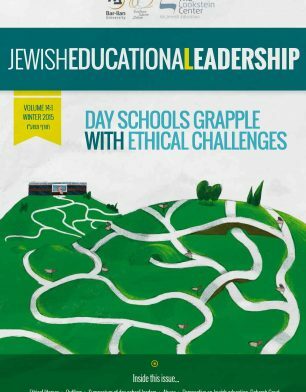 To read more about ethical challenges that face day schools, see below.